Quilters come in many varieties. Some do it all. Some love the quilting part best. And some only want to piece. If you’re one of the latter (or maybe you’re just too busy to quilt and bind your project right now), Whispering Pines Quilt Studio is here to help. My Gammill Statler Stitcher Optimum longarm quilting machine can quickly quilt your project edge to edge with an allover quilt pattern. Or I can work with you to identify a custom quilting pattern, with varying motifs reflecting the piecing and subject matter in the different areas of your quilt. There are many thousands of designs this machine can quilt, with more coming all the time. If I don’t have it, I’ll find it or make it for you. 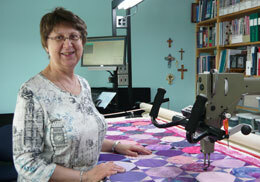 I also offer quilt basting, binding, seam repair, and attachment of hanging sleeves. Is your sewing space full of UFO’s (unfinished objects), that just need quilting and/or binding before they can go to a new home with a loved one, or on your bed or wall? Are you under a deadline to get a quilt ready for a show, and need help with quilting, binding and/or attaching the hanging sleeve? Are you running a busy quilt-related business with no time to finish your demo projects? If so, drop me an email or give me a call at 250-446-2520. I love to collaborate with my clients on their projects, and would be happy to hear from you. 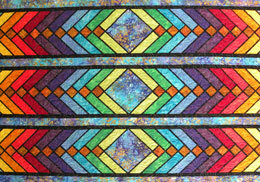 Learn about the options for quilting your creation. See some quilts I've completed for clients. 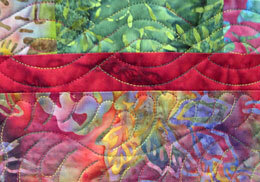 View some of my own quilted creations.